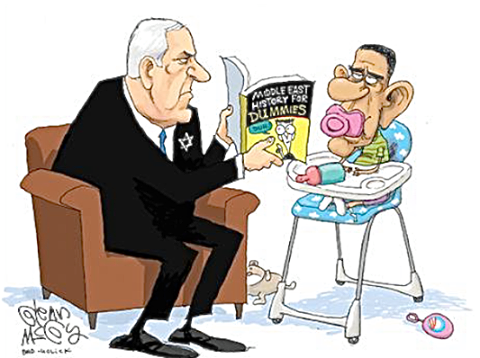 I thought it would be all about Israel Prime Minister Bibi Netanyahu. But it was all Hillary, all the time. Mitch McConnell makes his first interview since being majority leader and what a wimp he is. Tune in and learn what’s important to the political elite and what should be important to you. FOX NEWS SUNDAY (Fox Network): Rep. John Lewis, D-Ga. ; former Gov. Mike Huckabee, R-Ark. MEET THE PRESS (NBC): Sens. Dianne Feinstein, D-Calif., Lindsey Graham, R-S.C., and Claire McCaskill, D-Mo. ; Lewis. FACE THE NATION (CBS): Israeli Prime Minister Benjamin Netanyahu; Sens. Mitch McConnell, R-Ky., Chuck Schumer, D-N.Y., and Tim Scott, R-S.C.; Rep. Trey Gowdy, R-S.C.; Benjamin Crump, lawyer for the family of Michael Brown, the unarmed black 18-year-old shot to death by a white police officer in Ferguson. THIS WEEK (ABC): Mayor James Knowles of Ferguson, Missouri; former Secretary of State Colin Powell; Iraqi Prime Minister Haider al-Abadi. STATE OF THE UNION (CNN): Reps. Darrell Issa, R-Calif., and Adam Schiff, D-Calif.; former Attorney General Alberto Gonzales; former Sen. Bob Kerrey, D-Neb. ; journalist David Maraniss. Chris Wallace, host of Fox News Sunday, had quite and interesting talk fest with Lanny Davis, Clinton protector extraordinaire. Like the other political talk shows there was featured a big segment on Selma. It is the 50th anniversary and know that I remember this event very well. It was a major event in the history of this nation, true. I too walked with my colored brethren for even the worst of us believed everyone should be able to vote and Martin Luther King was my childhood hero. John Lewis was a guest as he’s the elected guy who crossed that bridge. Lewis has since, like so many heroes before him, sold his soul. Witness the formerly respected NAACP. Lots happening on Meet the Press. There was the mandatory visit by Lindsay Graham who talked about ISIS and is running for President. Chuck Todd, the host, also spoke to John Lewis about the Selma march, an event played up by President Obama until almost laughable. No way did Barack Obama go through what those marchers at Selma endured. Guy grew up in Hawaii, attended Harvard and smoked lots of dope. Todd made an interesting comment which I shall note. He told Lewis that since Selma over fifty years ago, America has essentially “self-segregated”. I am just not sure what that means and what Todd thinks we should do about it. Lewis said America has come a long way since Selma but still has a long way to go. Sure. No matter how perfect relations between blacks and whites are in this country there will always be one race-baiter who says it’s not good enough. John Lewis is one such example. The early story is that this guy called up a bunch of reporters and had them schedule a conference call soon with him. But before the call it seems he committed suicide. As I asserted in my post linked above, there’s way more to this story than meets the eye. The guy committed suicide because it would soon be public that he was part Jewish? I checked into this story and so far there’s not much new. But to commit suicide because it might get out that you’re Jewish? We’ve got eagle eye on this yon readers. Not so much talk about Selma on this Sunday political talk show. But lots of talk about Ferguson. Here’s the thing about Ferguson. Holder went in there full of fire and brimstone. His final report exonerated the policeman who shot the gentle giant BUT Holder’s justice department DID find some troubling statistics and cases that would lead one to believe the Ferguson police department is filled with racists just waiting to arrest people of color. Except the cop they investigated I must say. Lookit, go looking around in anyone’s closet and you’ll find skeletons. Ferguson, Missouri is like 65% black. At some point bad arrests will happen, rough stuff will happen….just as it does in precincts that are 65% white. The Obama administration, with the help of the best Attorney General this country has ever had, Eric Holder, wanted to made a talking point so they created one that didn’t deserve the scrutiny and they nosed around until they found something. OMG who should be see but Colin Powell who, for the right price, will say whatever you want. Powell asserted that he did use his own private email while Secretary of State but it was documented and archived per the rules. HE said the technology for emails was so bad in his day he couldn’t stand trying to make it work so he went private. As for Jeb Bush, well Colin is not making a stand. He’s probably waiting for that stipend from Jeb. There was some discussion of the current ongoing Supreme Court Case regarding the establishment of exchanges in states versus federal exchanges. A decision is not expected until June (why? Ask me….I’ll give them the answer NOW). A few quotes from the judges during arguments were given including one from Justice Kennedy, allegedly the deciding vote, to the effect that either decision by the court would be devastating. Which means what I do not know. Boring it was but Alberto Gonzales, former Attorney General of the U.S. spoke about Ferguson and he was all over the place. No way would Gonzales have done that joke of an “investigation” done by the best Attorney General this country has ever known, Eric Holder. But like the Blue Blood Republican Elite from whence he sprung, Gonzales didn’t take a stand. Mumbles McConnell made his first appearance since becoming Senate Majority Leader, God Bless. He did a pretty good job but when he asserted that Americans want their congress people to sit down and decide what they can do together that it is all no good. Somebody tell the Republican elite that no, we do NOT want them to sit down and make laws. In fact, if both parties and parts of congress were to decide that today no new laws need to be made…WE’D LOVE IT OUT HERE IN LA LA LAND WHERE WE CARRY THIS COUNTRY ON OUR BACKS! Elect these guys and they want to make laws, gain fame for themselves, the hell with us peons who must live with it. 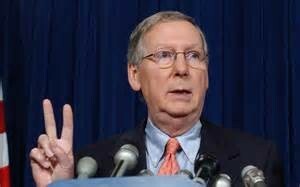 Do not forget this is the Republican Senate Majority Leader. NEXT :Sussex GOP tomorrow night, will be writing about this. We’re going to be introducing a new feature….to the effect of some NATIONAL tidbits. We’ll concentrate on Delaware, of course, but there’s a slew of stuff going on that needs my commentary. Consider Net neutrality, the Menendez Indictment….much more. Coming up soon. 6 Comments on "The National Scene-The Sunday Political Talk Show Report on 3/8/15"
Oophs! I meant DAVID Anderson. At least I am good at self-initiated, self-correction–unlike a lot of the lot that posts on these sites. When asked by a CBS reporter about when he learned of Hillary Clinton’s private email controversy, what do you think Obama’s response was? Here’s a hint. It’s what he always says. Me too. 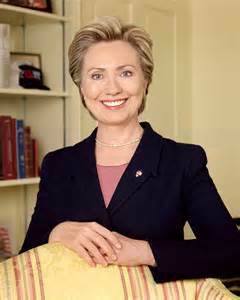 She usually looks like a worn-out old hag. Maybe she just had her Botox treatment? It is pathetic that an allegedly “conservative” party would have a weak, appeasing lifetime parasite like McConnell as Majority Leader. He is emblematic of the GOP’s image problem. He needs to go. Can you imagine a Democratic Speaker inviting a foreign leader to undermine the work of a Republican POTUS? Talk Radio and Fox news news would be spinning their heads and spewing TREASON 24-7 like rapid dogs. What a pathetic hateful party that can only thrive on the hate, fear and misconceptions of low class white rubes.. The Party of Hate holds more seats in the US Congress and state legislatures than at any time since 1928. Thank you, Little Red Star.